UK Column News reports on the Melanie Shaw case, 3 July 2018. 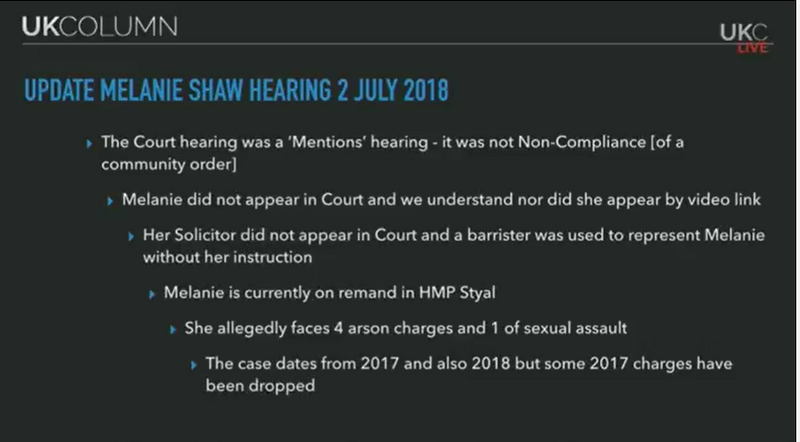 Following the Mentions hearing on 2 July, Melanie Shaw, the Beechwood child abuse survivor, is to appear at Leeds Crown Court on 10 July 2018. Brian Gerrish goes on to say: "She is going to face arson and sexual assault charges and these alleged offences were, of course, carried out in prison." "Now having said that there`s been huge confusion about what has been happening to Melanie. This is not unusual because it was happening at the very start of Melanie`s trials and tribulations, before she went into prison for the very first time and continued all the way through. But... 2 July, let`s have a little look at what we can report on that. So this was a hearing which was not posted publicly until a few days before. Now that can be normal. 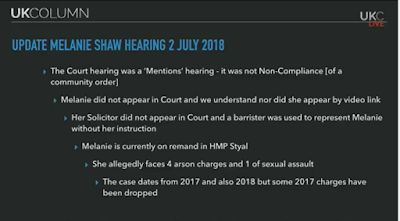 Sometimes it`s not, but the pattern with Melanie Shaw is usually postings publicly of her hearings are ... very late, if at all." "But what do we know? Well the court hearing was a `Mentions hearing` and the UK Column was accurate in reporting that ... 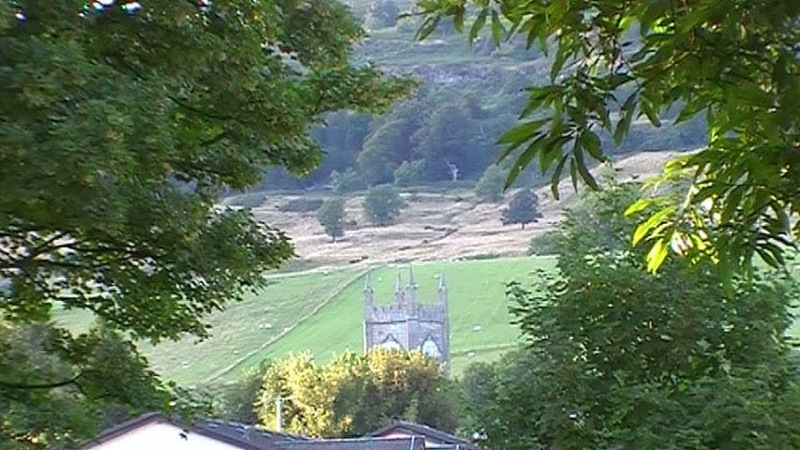 Some people saw a report that it was a `Non-compliance hearing` of a `community order`. That was never the case. It was to be a Mentions hearing and that is actually what took place. 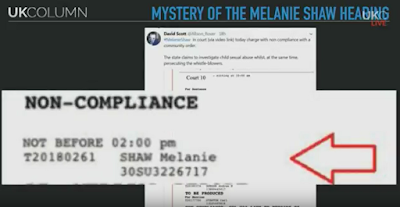 Now we understand that Melanie did not appear in court, nor did she appear by video link, and this is normal for the cases with Melanie that she has certainly not been appearing in court; and, of course, where she has had the advantage of a video link that has often broken down as Melanie started to stand up and give her own defence." "So we would say to our audience today if you want to understand the dangers of the wider upgrade of the court system which Mike has been talking about in many UK Column news editions we are now really starting to see it because where the state has got a vendetta against the accused they can simply make sure that you can never get your evidence into court because they cut the video link." "Now her solicitor did not appear in Court and a barrister was used to represent Melanie without her instruction." "This is where things get subtle because I have to say at the moment I`m not able to release all the information that I have. That is for Melanie`s protection. But the fact that her solicitor did not appear in court, there`s not necessarily anything to read into that. However, that a barrister was used to represent her without her instruction we find very strange. That is as much as I can give on that. We may be able to report more in the coming days." "So Melanie is currently on remand in HMP Styal. 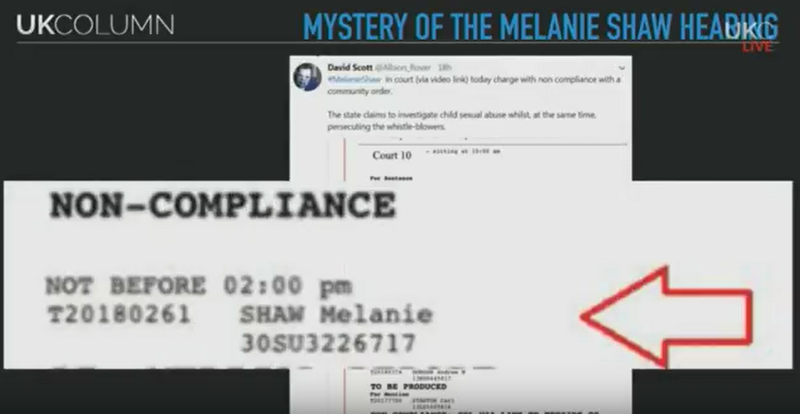 Remember that this lady has now served over two years in prison and at least 18 months of that time, possibly nearer nineteen months, she`s spent in solitary confinement and remember that Melanie is a child abuse survivor. She does suffer with trauma, and solitary confinement must have been one of the most vicious environments to put her in that we can imagine. Whether this will be taken into account in the charges we don`t know. She is allegedly facing four arson charges and one of sexual assault. What I can say is at the time these charges were created Melanie was able to say to some of the people in communication with her that she was facing extreme bullying inside the prison. She was fearful for her safety and she frequently talked about being put in a situation where she felt she was at risk of assault, certainly by - I`ll say overzealous warders - but also by some of the other inmates..."
"We understand that some of the original 2017 charges have been dropped." "So, how can we sum this up? Well we can best sum it up by saying that it is remarkable that in Theresa May`s conservative Britain in 2018 an extremely vulnerable child abuse survivor is not only kept in solitary confinement and brutalised in a series of British prisons but when her case goes to court we suddenly end up in a black hole where the video links don`t work or the public notices are not published on time. Well there`s a reason for this. We think there is. But let`s have a look at some of the evidence that other people saw." "This is a report that several picked up where the day was listed as a Non-Compliance hearing. So where this came from we don`t know because it was clear via the legal teams that this was to be a Mentions hearing, and a Mentions hearing if you don`t know is simply the discussion on the procedural aspects of the case." "Why was it reported as Non-Compliance? We don`t know." 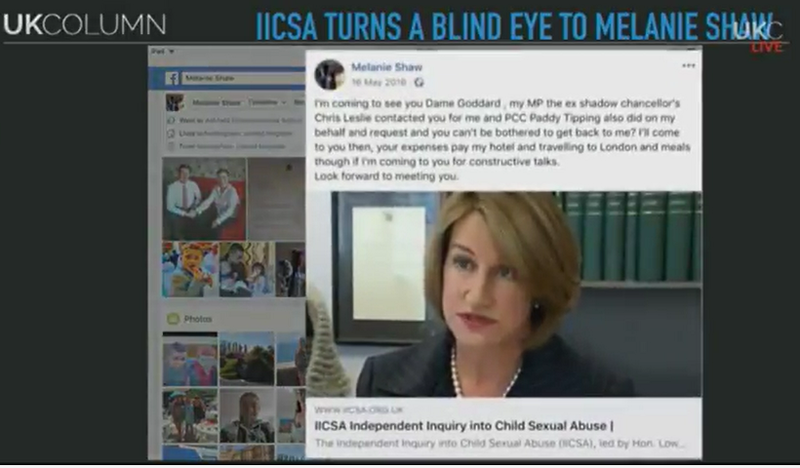 "Now let`s bring in the Independent Child Sexual Abuse Inquiry because I have been personally in correspondence with them about Melanie Shaw and this was a response that I received." "Thank you for contacting the inquiry via our Information Line on 13 June. 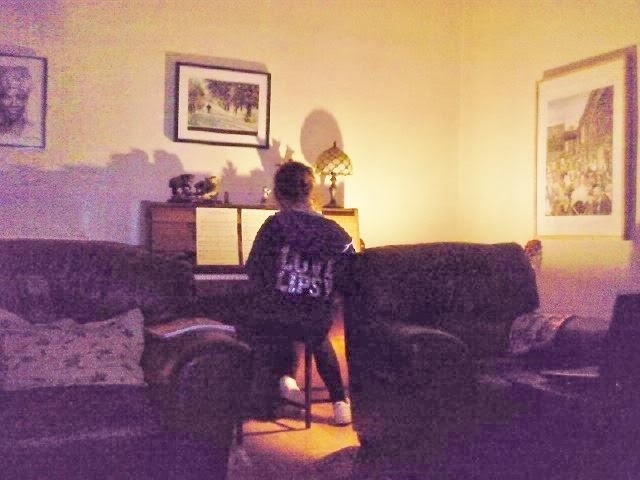 I believe that in your call you asked what the inquiry will do to obtain evidence of abuse at Beechwood Children`s Home from a specific individual who is currently held in prison." "Well of course there was no specific individual. The lady I was referring to, and referred to in detail, was Melanie Shaw and I was very confident in doing that because as we will see Melanie Shaw has consistently tried to give evidence to the Child Abuse Inquiry. They went on:"
"I am afraid that unless we have the consent of that individual we are unable to contact the individual directly, nor discuss that individual`s alleged experience with anyone else. This is to ensure her confidentiality and right to privacy are preserved. If this individual chooses to contact us directly, then we will be happy to engage with her." "Brian Gerrish explains: "But the whole point of my call was to report that of course Melanie did not have normal communications and therefore had been unable to make contact with the Inquiry. Hence I alerted the Inquiry and suggested that they actually spoke to her directly. However, we now see that they are not prepared to go into prison to talk to any of the abuse survivors who are currently in prison." "The Inquiry`s Terms of Reference, which are available on our website... state that we will pass all allegations of child abuse to the police. 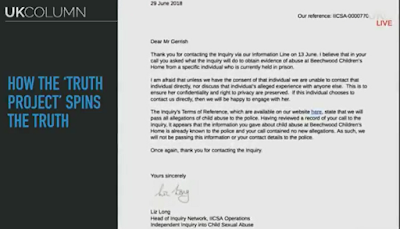 Having reviewed a record of your call to the Inquiry, it appears that the information you gave about child abuse at Beechwood Children`s home is already known to the police and your call contained no new allegations. As such, we will not be passing this information or your contact details to the police." "This is remarkable Mike because of course one of the points I made is that when Melanie attempted to give information she was bullied and harassed by the police and subsequently has been put out of commission in prison. So my warning was that the Inquiry needed to speak to this lady in order to see through the wall of silence which has occurred with the help of Nottinghamshire police." "But it gets more interesting. Let`s move on to this one. I just need to catch up with myself on the other screen. Here we are. So this is an email which has been sent to another IICSA lady, Elizabeth Long. I`ll read it very quickly." He reads: "Attached is a letter you have sent to and been forwarded on to me by a colleague. I am the Lay Advocate of the lady in question and I do have lawful authority to act for her and have endeavoured to have her rights upheld and her wishes, which are publicly known about from her approaches herself, and on her Facebook page requesting full participation in this inquiry." "I have been contacting the inquiry since October 2016 on her behalf as she is unlawfully detained against her will and seems there are thousands of prisoners who are being denied access to this inquiry who have had lives of hell due to institutionalised child sexual abuse in the care system in UK." 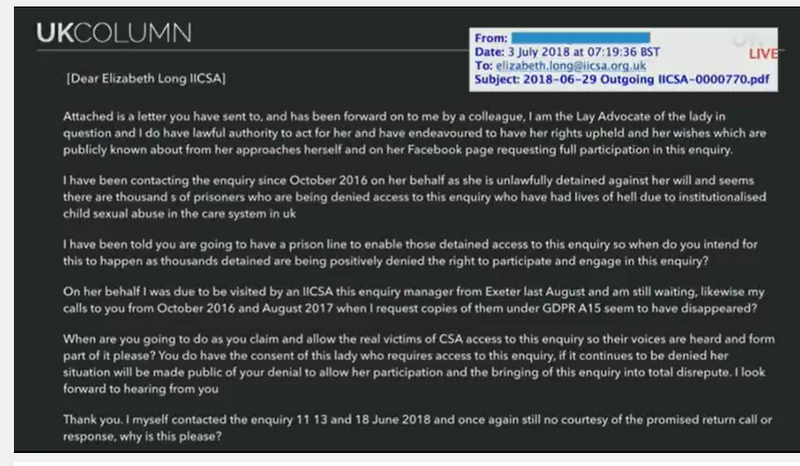 "I have been told you are going to have a prison line to enable those detained access to this inquiry so when do you intend for this to happen as thousands detained are being positively denied the right to participate and engage in this inquiry"
"On her behalf, I was due to be visited by an IICSA individual, an inquiry manager from Exeter last August, and am still waiting, likewise my calls to you from October 2016 and August 2017 when I requested copies of them under GDPRA15 seem to have disappeared?" "When are you going to do as you claim and allow the real victims of CSA access to this inquiry so their voices are heard and form part of it please? You do have the consent of this lady who requires access to this inquiry. If it continues to be denied her situation will be made public of your denial to allow her participation and the bringing of this inquiry into total disrepute." "I myself contacted the inquiry 11, 13 and 18 June 2018 and once again still no courtesy of the promised return call or response. Why is this?" "So Mike, it`s becoming very very obvious that the Child Abuse Inquiry does not want to speak to Melanie Shaw. We say that this is because of the very detailed information that Melanie Shaw holds and of course Melanie showed very early on that Nottinghamshire police were not investigating the Beechwood case properly." "Well here is the evidence that Melanie herself was very keen to speak to the inquiry." "Part of the Facebook posting." "And it says here: `I`m coming to see you Dame Goddard. My MP the ex shadow chancellor`s Chris Leslie contacted you for me and PCC Paddy Tipping also did on my behalf and request and you can`t be bothered to get back to me?` "
"Same message isn`t it Mike?..." 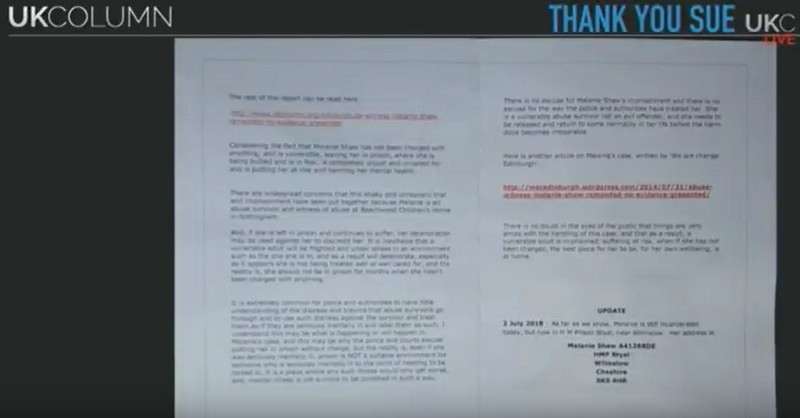 "So Melanie herself declared it publicly that she needed to speak to the Inquiry but ... the Inquiry simply says `Go away.`"
"Well we have a little bit more but we`ll keep it very short here because this is part of a communication with the Inquiry about missing information." "And if I go down to the last paragraph here it says:"
"I have been advised that you said you made contact with the Inquiry last year however there is no record in any of our systems of this call. Now I`m summarising that considerably Mike because viewers can freeze that screen but once again we`re into missing data. We don`t know who called. We don`t know what happened to the phone records. I think we`ve seen all this before." "And I`m not alone in warning about what is happening with this ...and I just wanted to say `Thank you very much to the person ... who produced this leaflet which was sent to us`. We received it this morning. If you freeze it on screen you can read it. But somebody has taken the time and effort here to try and put together a short concise summary of what`s happened to Melanie Shaw." "We will continue to report but I think we have to say the evidence is growing that the Independent Child Abuse Inquiry, in England and Wales at least, is disingenuous, a sham. We`re not too sure between those two, but we`re going to continue to expose what`s happening." 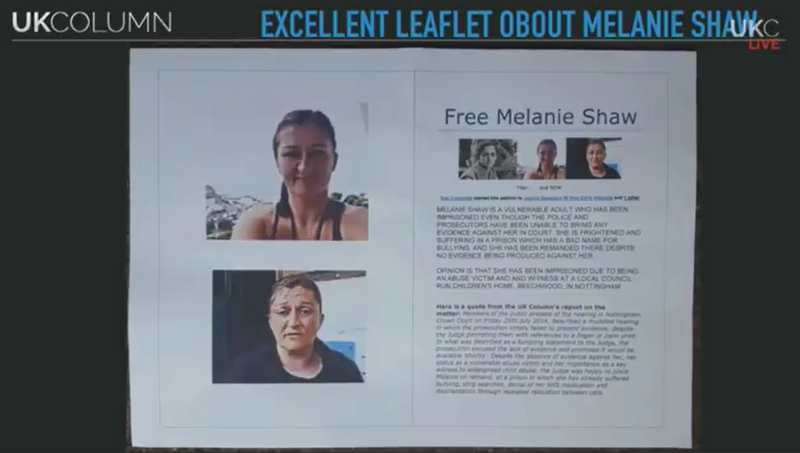 Mike Robinson: "And of course while Melanie is stuck in prison it`s very very difficult for her to pursue her rights." "They`ve got her completely pinned down Mike. So she goes through the abuse. You set up a national inquiry to talk to abuse survivors and then you make sure that Melanie Shaw can`t speak out. And why do we think that is. Because Melanie Shaw`s information, not only includes the abuse of children at Beechwood, but also in a wider capacity, and again brings in the British political establishment." Who`s behind government policy ?